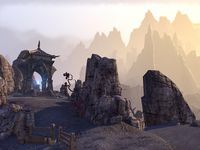 Guarding the pass to the Rift in Skyrim, Fort Virak is garrisoned by elite Dark Elf soldiers tasked with the defense of Stonefalls' western border. 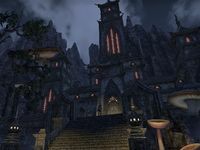 Placed squarely athwart the main route western armies must take to invade Morrowind, the old fortress has survived many a siege. Ruin: After a series of mysterious collapses, the maze of hallways beneath Fort Virak was walled off and abandoned sometime during the Akaviri Potentate. Fort Virak is a fort in northwestern Stonefalls. The fort is besieged by Covenant soldiers and zombies. Fort Virak Objective: Repel Covenant forces from Fort Virak. Breaking Fort Virak: Help liberate Fort Virak from the Covenant forces. Evening the Odds: Help the Pact troops get inside Fort Virak's courtyard. The General's Demise: Put an end to the Covenant invasion of Stonefalls. To Fort Virak: Assist the Pact troops at Fort Virak. Fort Virak Wayshrine is located south-southeast of the fort, on a plateau. This page was last modified on 6 March 2019, at 18:06.